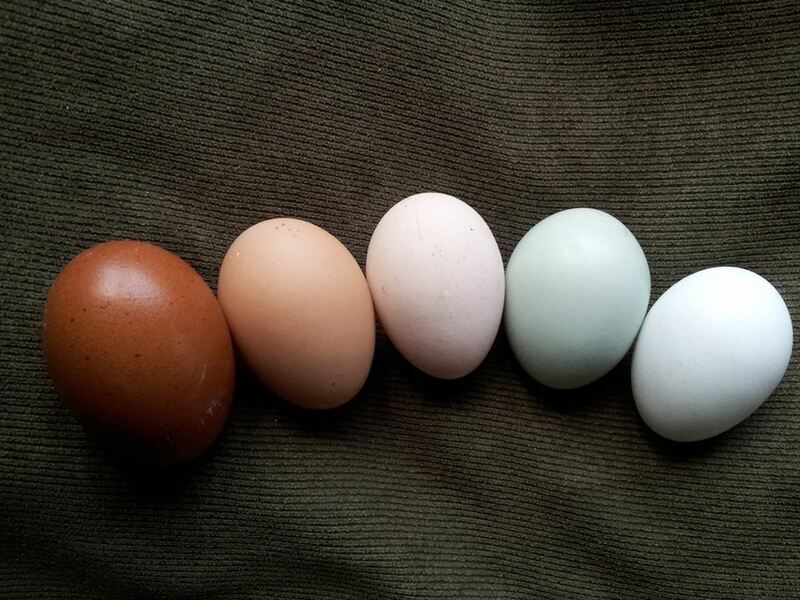 Eggs come in all sorts of colors. Many hobbyists and backyard poultry owners desire a colorful egg basket. Is it genetics or does the bird choose their colors? It is actually both! All eggs start out white or blue. If the egg is tinted, the color of the egg’s eggshell occurs during the last stage of formation in the oviduct. The last step before the egg is laid is the pigment. The hen of the species or breed deposits their pigment onto the egg shell within the oviduct. Depending on the breed and genetics, the pigment can be pink, brown, green, speckled and more! Within the oviduct the egg shell color is the result of porphyrins being deposited while the eggs are in the process of their formation. The brown egg color is due to the pigment protoporphyrin. Rhode Island Reds and Buff Orpingtons are examples of chicken that lay brown eggs. Ameraucanas and Easter Eggers lay eggs that are blue to blue-green in color. These breeds produce a pigment called oocyanine. Marans lay a dark brown egg due to the poryphyrin pigment, however to get that dark color, it has to oxidize, just like iron. Dark green eggs, such as those laid by the Oliver Egger, is a brown pigment over a blue shell. Just like the chemical made up in the breeds, genetics play a huge role as well. In order for a color to stay constant, selective breeding needs to be done. Without proper breeding, egg color can lighten and become less desirable. There are so many breeds to choose from that lay beautiful eggs!